We'd like you to relax and have a good time on your holidays, the Club makes every effort to make sure that happens. With a few sensible precautions and being aware of any hazards, everyone can have a great time and enjoy their holiday. To make sure any fire won't spread, keep your outfit at the required distance from others. See 'Your Pitch' (4.c) for details. Carbon Monoxide kills. Keep barbecues out of caravans, motorhomes, awnings and tents. Make sure you keep barbecues away from outfits and hedges and outside of awnings and tents - please don't leave them unattended. Let hot ashes cool down before putting them in the rubbish. Make sure exhaust from generators is properly vented away from occupied areas. Carbon Monoxide is a colourless, odourless, highly poisonous gas that can kill in minutes. Carbon Monoxide poisoning can be caused by any fuel that burns or smoulders. Barbecues can continue to give off Carbon Monoxide for 12 hours after they have been used. 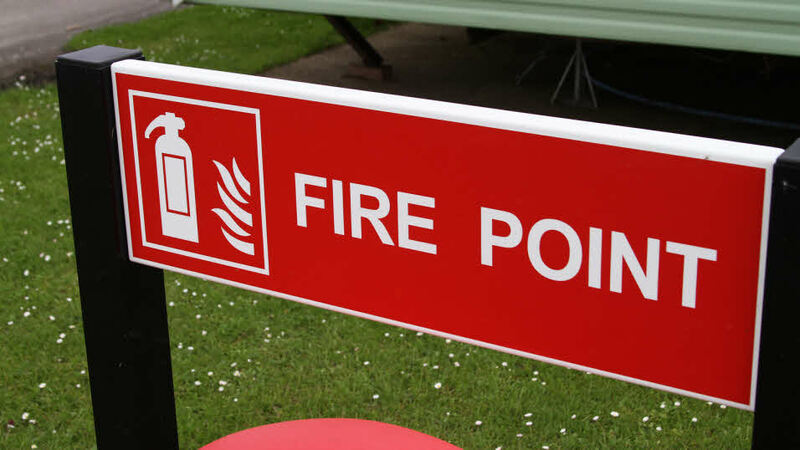 You'll find Fire Points at every Club site, so when you arrive check where the nearest one is. Then you can raise the alarm if you discover a fire. Also make a note of where the assembly point is. Please read the evacuation notice, too. Fire extinguishers are provided at the fire points. Please make sure you are familiar with their use, prior to attempting to put out a fire. If fire breaks out, follow the site staff's instructions. Keep your children safe by making them aware of the danger of emergency services rushing to the scene. We recommend that you have a fire extinguisher, fire blanket and smoke alarm in your outfit. They should be checked and serviced regularly so they're always ready to use. Fire buckets are very handy, too, but must not be used on electrical fires. For everyone's sake, please keep your speed down. The speed limit on all sites is 5mph; that's a fast walking pace. Pedestrians always have right of way when crossing site roads. Please take care at all times especially when near play areas and when you're reversing. Make sure you follow any one-way systems. When you've sited your caravan, where possible park your vehicle alongside with the handbrake securely applied. Please take care walking on site roads and tracks, as they may be uneven. When the weather's bad, paving slabs serving as paths often become slippery and may be uneven. If you see anything that looks hazardous, please tell the Site Staff. There are speed humps on many roads, so when walking take care. Don't walk or cycle under raised barriers in case they lower unexpectedly. Road lighting, on those sites where it's installed, is generally low-level subdued lighting and spaced to meet local authority restrictions, reduce the environmental impact and effect of light pollution. We suggest taking a torch with you if you leave your caravan after dark. We suggest sticking to a familiar route if you need to walk around a site after dark. Some sites are open all year, or situated in exposed areas. In snow and ice conditions site staff will treat high risk areas such as pathways, around the reception, toilet and shower blocks, service points and barriers. Site staff and members shouldn't risk their own safety to protect property in poor weather. Wait until conditions improve to take action. To keep site standards high, the shower and toilet blocks are cleaned daily. They'll be closed during cleaning. Floors may be slippery, so please take care. Take care when using showers and taps. We make sure the water is temperature controlled to avoid Legionella. The parents or guardians are responsible for the safety of children in their care at all times whilst on site. Please refer to Club Site Rules 13.b regarding road safety. Play areas are never entirely risk free. Age restrictions will be indicated on the equipment and please remember you are responsible for your children on site. Bikes, scooters and skateboards are allowed, but we ask you to keep your speed down to walking pace on the site and to be aware of uneven surfaces. Please follow the site's one-way system. Please refer to Club Site Rule 13 for information on road safety. For the safety and consideration of others, we don't allow the use of petrol or electric scooters on site. We encourage wildlife and maintain natural surroundings where possible, so take care when walking around the site. Molehills and rabbit holes, tree roots and uneven ground are likely to be present. We advise you to keep your eyes peeled for hazards and wear appropriate footwear. On sites located on or near to farms, take care if there are animals around. They can be unpredictable, so parental supervision is required. Please don't let children get close to the animals unless given permission by the farmer. Always wash your hands after contact with animals. Be careful on hard standings as they are generally loose gravel and may be a trip hazard. Electrical hook-up posts usually serve several pitches. Please make sure your cable is placed as close to the edge of the pitch as possible. Please put any excess cable under your outfit so that loose cable becomes less of a trip hazard. Don't coil your excess cable as it can overheat and catch fire. Most caravans and motorhomes have Liquid Petroleum Gas (LPG) systems fitted as standard. We strongly advise that members have their gas system checked by a "Gas Safe" registered fitter annually, before use. The maximum size of LPG cylinder permitted on site is 15 kilograms. Cylinders should be stored upright in the locker provided by the caravan or motorhome manufacturer. The Caravan Club strongly advises against the use of external LPG cylinders on site. Members who do use external LPG cylinders must ensure that the cylinders are secured adequately, to ensure they cannot be knocked over or accidentally fall. If you are absent from the site for more than 24 hours, external cylinders must be disconnected and stored in the site's compound until your return. These areas are only for domestic waste. If you have waste such as broken glass and batteries, ask site staff who will offer advice regarding disposal. Hazardous waste cannot be discarded on site. If your site is close to water, take extra care, especially if you have children with you. Please warn your children of the dangers and ensure they are supervised at all times.